If you’re interested in streaming one of the newly available 4K videos on Netflix, be prepared to pay extra for the privilege moving forward. Variety is reporting that the Internet video giant now requires new customers to sign up for an $11.99 per month family plan to access its slate of Ultra HD (4K) titles. Previously, you could access content in 4K resolution with a standard $8.99 per month “streaming only” plan. “We decided to move 4K UHD video into our four-stream plan for new members who sign up and care about the highest-quality video Netflix offers,” a spokesman from Netflix told Variety. “We have a modest and growing catalog of titles in 4K, including ‘House of Cards,’ ‘Breaking Bad,’ ‘The Blacklist’ and a slate of upcoming Netflix original series.” Netflix blames the higher cost of producing and licensing Ultra HD content as a reason for the move. The high price and limited availability of Ultra HD content are only two of the factors slowing adoption of the next-generation technology. Ultra HD televisions remain prohibitively expensive (with some limited exceptions). And streaming content in 4K requires an Internet connection capable of delivering consistent speeds of 20 – 25 Mbps; the current U.S. average is just 11.4Mbps. Amazon offers a small number of movies and original programming in 4K Ultra HD for Amazon Prime subscribers. A limited number of YouTube videos are available in 4K resolution, too. 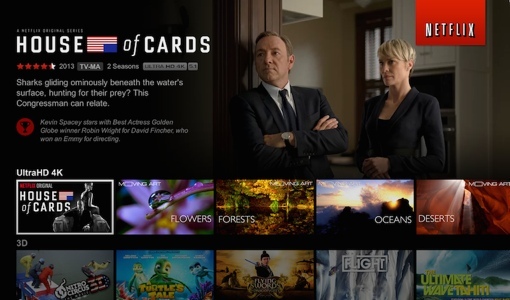 Cable giant Comcast, meanwhile, is expected to offer 4K streaming content through an Xfinity TV app later this year.